If My Email Account is Hacked, What Kinds of Things Should I Check? - Ask Leo! When a hacker has access to your email account, they can do anything -- even change settings you know nothing about. Let's take a look at some of the possible dangers. Leo, in your article about email being hacked and what you need to do, it’s possible that you may have omitted one important problem associated with account hacking: the changed return address. When my Yahoo account was hacked (my own fault, signing in from a fake email), the last thing that I noticed as I restored my account was that they had changed one letter of my name in the return address. If you clicked Reply to any email that I sent out, it went to them and not to my real account address. Actually, you raise a very interesting and important point. It’s difficult to list all of the things that a hacker could change after they access your account. Let’s look at a few of the most common things. As you point out, hackers can change the Reply-to address so that people replying to your email reply to the hackers instead. Sometimes, it’s obvious that the reply address is completely different. Other times, there will be very subtle changes, like a single letter difference in the email address that the person replying to you doesn’t notice. When received in many email programs will show only “Leo A. Notenboom” by default – yet if the recipient replies, it’ll go to that hacker’s email address. It’s also very common that a hacker would set up an auto-forward rule so that every email you receive is forwarded to them automatically. Now, that may seem odd until you start thinking about account recovery and related scenarios. It’s one of the ways that hackers use your email account to hack into your other accounts including those of other online services, including your bank. Hackers can also add, remove, or alter entries in your contacts or address book. You may think you’re sending something to Aunt Mary, but it might not be her at all. They can modify your spam filter settings and rules. In other words, they can make sure that you see all of the spam that’s headed your way. They can even alter any automatic filtering rules that have been supplied by your email provider. For example, in Gmail, if you have filters set up that automatically label email as it arrives, hackers could change those rules while they have access to your account. They could even alter what server is used to send mail. For example, Gmail allows you to specify an alternate server to be used when you send email. There are various reasons for this, but it allows you to use your Gmail account to send email from a non-Gmail email address. A hacker can change or even add that configuration without you realizing it. After they do, all of the email you send would go through a hacker’s email server rather than Google’s servers. In the end, there’s just so much functionality that email servers provide these days that it’s hard to list everything that the hacker could possibly touch. So, after you recover an account, the short answer is to check everything: all of the settings, all of the options, all of the rules, all of the filters, and even the contents of your address book. It’s all fair game to hackers while they have access to your account. « Previous post: Why Does My Monitor Go Dark for a Few Seconds? but without knowing code can they hack my account ??? They shouldn’t – that’s the whole point of that code. So my other question would be how do I transfer my yahoo account to my gmail account ? If you can get into your Yahoo account using your office computer then you still have access. You are going to have to work through resetting the password. In the end you have no choice but to follow the instructions Yahoo gives you until you get a password that works… and then remember it. You can certainly “transfer” your Yahoo account to Gmail simply by setting it up so that Gmail retrieves the Yahoo mail. But you are going to need your Yahoo password for that. So ultimately you have to reset the password anyway. I had a yahoo email account that was hacked twice and spam sent to all my contacts. I ended up closing the account but my contacts are still receiving the spam because the hacker is using my name as the display name. Is there anything i can do to stop this? My other gmail account has been compromised . Somebody from a nigeria ip address has logged in my account and he has changed the language to chinese and also all mail is being forwarded to another account . Please read the article you are commenting on, as well as the related articles listed. I know that my email has been compromised, the codes sent by Microsoft is still not allowing me to get back in, but if Microsoft has blocked the account does that mean that the hacker is blocked out as well? I cant remember the password of my yahoo email and i forgotten the answer for the security question.My yahoo email is not attached to any other email. Is there anyway to reset my password? someone has hacked into ALL of my accounts my instagram, email, EVERYTHING! I have no idea what to do now! Are they stealing my identity and it was someone from California. And as I am writing this, he is hacking me and stripping me. Hi. This is currently happening & been happening for over1.5 years… did you resolve this?&& if so, can you share w me?? Pls help me as my account was hacked and I cant access any contact on my address book. I want to send an apology to all on my contact but found no contact on my address book. I have been hacked and they have created a signature with my name and title and logo. We have changed the password to my Tahoo account , but I still cannot get into my emails to receive or to send out,, your thoughts. Please my gmail account has been hacked, and eve though I already change my password 2 yrs back now, but it seems that same hackers still come across in my gmail account. You should be able to secure your account using the methods outlined in this article. A strong 12-14 character password not containing guessable words is essential. And you might consider 2 factor authentication requiring you to enter a one time password which you receive on your mobile phone. Is there anything I can do about the hacker if I know the hacker’s IP address? this is the hacked email address with my profile still attatched since 2013 what can i do and how do i report to police through this comment ..I want to charge these people or person this is a fedral offense .what can i do ???? You should report this to the police, although unfortunately, there’s not much they can do. They are usually backlogged, and this kind of hack isn’t alway high priority for them, and in most cases the hacks come from a country with little of no enforcement of cybercrime laws. these people need to be arrested !!! The number should be updated instantaneously when you enter it. It sounds like the hacker might still be able to get into your account. Changing the password is not enough. It’s necessary to change all of the recovery information associated with the account. My email/hotmail account has been hacked but I can;t change the password as the language is in Arabic so I don’t know which option is change or reset password – what can I do? Please what should I do..
Change that setting in the settings for your email account to remove the bogus address. Look for the From: address or “Reply To” setting. If I send anyone an email from my yahoo address it comes up as being sent from someone called Kevin Campbell. I have checked my settings and it has the correct information on it. Have I been hacked somehow? How can I get rid of the name Kevin Campbell and have my own name appear instead? It depends on what program you’re using to send email. If they hacked a gmail account. Would they be able to see the things I do on my computer? can someone else transfer my phone number and email address to their house and pretend to be me without my authorization? Shouldn’t be able to, but it depends on the security measures of your telephone company. Can my computer be hacked and someone add email addresses and passwords to my computer. They are showing up in credential manager. Thank you. I am thinking an ex family member who is a computer program designer. Several emails go to my junk folder that are not junk. I have added their email addresses to my contacts, but they still go to junk. Any other hints to solve this? Depends on your email program, but carefully mark each as “Not Junk” or “Not Spam” when this happens. That — not the address book — is how most spam filters learn. 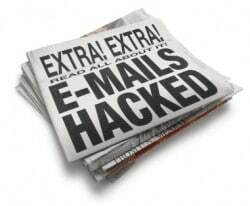 Thes articles outline the steps you can take to recover a lost or hacked email account. They would only work if the hacker hasn’t changed all of the recovery information.